SHAKESPEARE, William. Eight Tragedies in Italian. Firenze: Vittorio Alauzet , 1814. 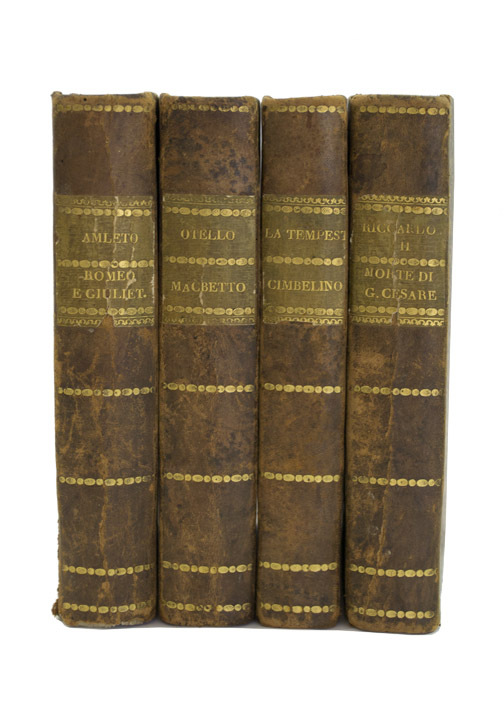 Eight titles in four octavo volumes (7 3/4 x 4 7/8 inches; 195 x 125 mm). Each volume with two plays. Uniformly bound in contemporary half calf over marbled boards. Spines stamped in gilt. 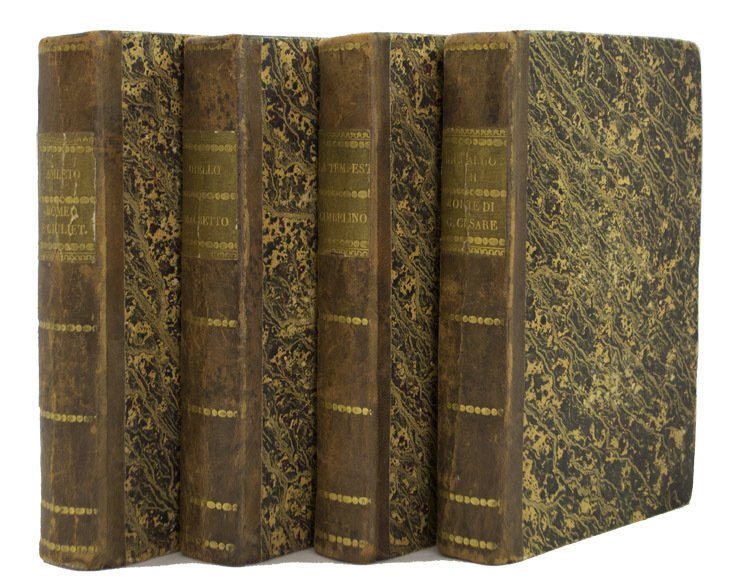 Each volume with spine label, lettered in gilt. Some rubbing to boards. Tail of spine of Amleto volume a bit chipped. Spines of Amleto and Riccardo III cracked, but holding firm. Some minor chipping to spine labels. Overall a very good set. Aside from the British Library and the Folger Library we could find very few of these titles at any other libraries. 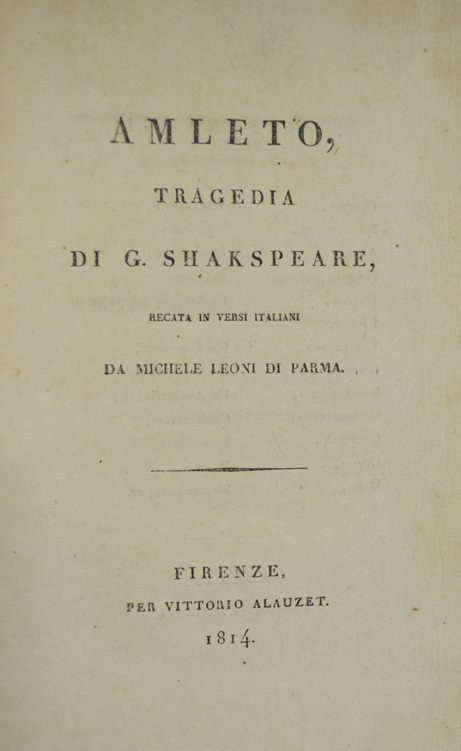 Amleto, Tragedia di G. Shakspeare, Recata in Versi Italiani Da Michele Leoni Di Parma. Firenze: Per Vittorio Alauzet, 1814. First edition to be translated into Italian and published for the first time. 264 pp. With half-title. The true first full translation dates back to 1777 by Alessandro Verri, but the manuscript was never published. There were also some adaptations for stage that were translated in the late eighteenth-century. But this present translation by Leoni is the first full translation in verse. "Hamlet in Italy (1700-1945) Fernando Cioni"
Romeo e Giulietta, Tragedia Di G. Shakepeare. Recata in Versi Italiani Da Michele Leoni Di Parma. Firenze: Presso Gio. Marenigh, 1814. First Edition in Italian. 194, [1, publisher's ads], [1, blank] pp. With half-title. "Leoni's translation constitutes an important step in the introduction of Shakepeare's Romeo and Juliet in Italy. 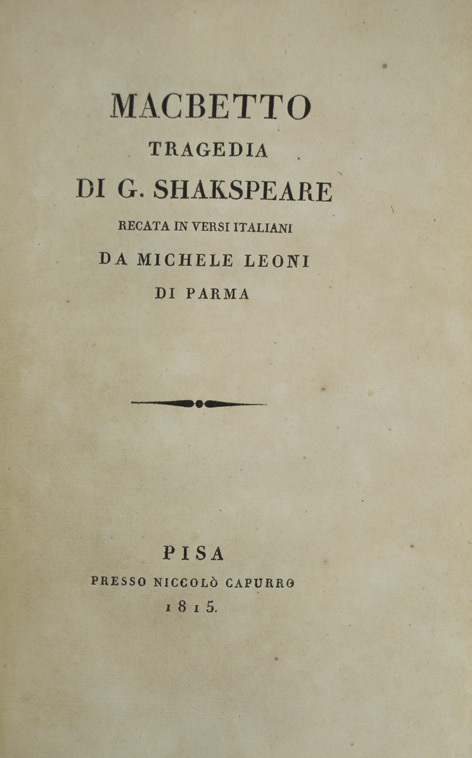 Although it is likely that Leoni translated from French, his work is important becuase it is the first Italian translation of Shakespeare's play, and it is an example of the new, more source-oriented approach to translation that developed through the nineteenth century." (Reclaiming Romeo and Juliet: Italian Translations for Page, Stage and Screen. By Vincenza Minutella, pg 83). Otello i Il Moro di Venezia, Tragedia Di G. Shakepeare. Recata in Versi Italiani Da Michele Leoni Di Parma. Firenze: Prt Vittorio Alauzet, 1814. Early Italian edition. xvi, 262, [2, blank] pp. Previously translated in prose by Giustina Reiner Michiel in 1798. Alessandro Verri also did a translation. However these translations do not seem to be attainable. Corner torn of page 217-218, not affecting text. Macbetto, Tragedia Di G. Shakepeare. Recata in Versi Italiani Da Michele Leoni Di Parma. Pisa, Presso Niccolo Capurro, 1815. Early Italian edition, however no earlier edition in Italian can be found on OCLC. 162, [1, errata for "Cesare"], [1, blank] pp. With half-title. Previously translated in prose by Giustina Reiner Michiel in 1798, however this translation does not appear to be attainable. A few signatures with some toning. La Tempesta Dramma Di G. Shakepeare. Recata in Versi Italiani Da Michele Leoni Di Parma. Pisa, Presso Niccolo Capurro, 1815. First Italian edition. 160 pp. with half-title. Some dampstaining and minor toning. Cimbelino, Tragedia Di G. Shakepeare. Recata in Versi Italiani Da Michele Leoni Di Parma. Pisa, Presso Niccolo Capurro, 1815. First Italian edition. 219, [1, blank] pp. With half-title. Some minor toning. Riccardo III. Tragedia Di G. Shakepeare. Recata in Versi Italiani Da Michele Leoni Di Parma. Firenze: Presso Gio. Marenigh, 1815. First Italian edition. 268, [errata slip] pp. With half-title. Small stamp "Sacchi Defendente" on bottom margin of half-title. La Morte di Giulio Cesare, Tragedia Di G. Shakepeare. Recata in Versi Italiani Da Michele Leoni Di Parma. Pisa, Presso Niccolo Capurro, 1815. 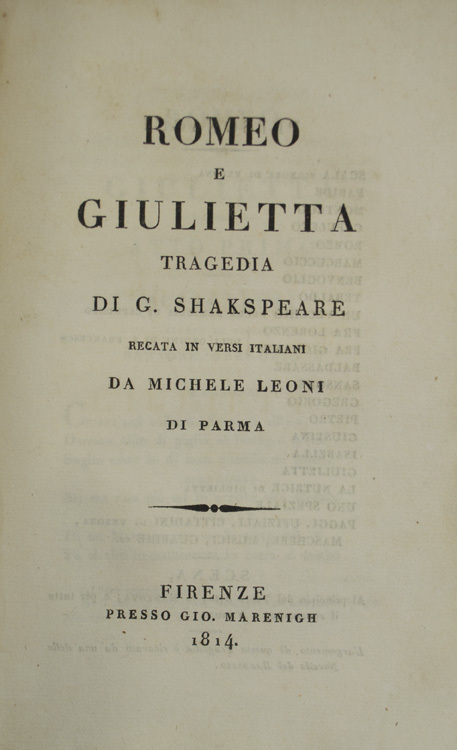 'What Italy knew of Shakespeare in the eighteenth century, as has been shown, was drawn exclusively from Voltaire, and the same is true of Spain; and both countries made their first acquaintance with the poet as an acted dramatist through the medium of the mutilated French versions by Ducis. The real work of translating and studying Shakespeare was not begun in either land until the nineteenth century. 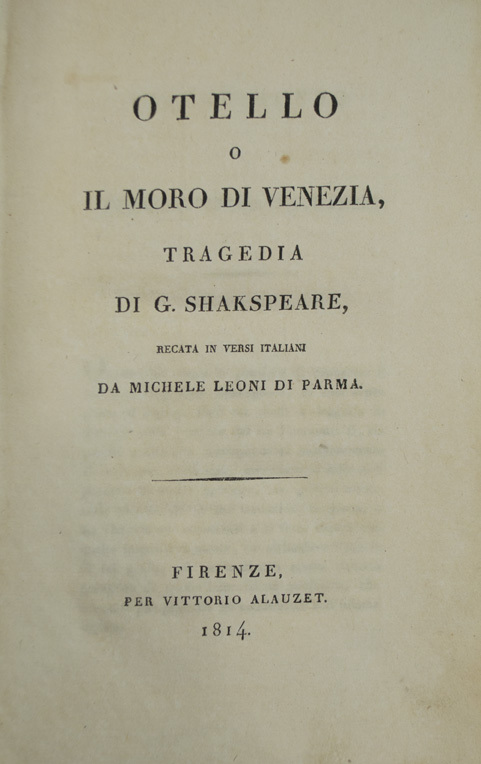 A translation of Shakespeare’s tragedies into Italian verse by Michele Leoni was published at Pisa in 1814–5." (The Cambridge History of English and American Literature, XII. Shakespeare on the Continent).